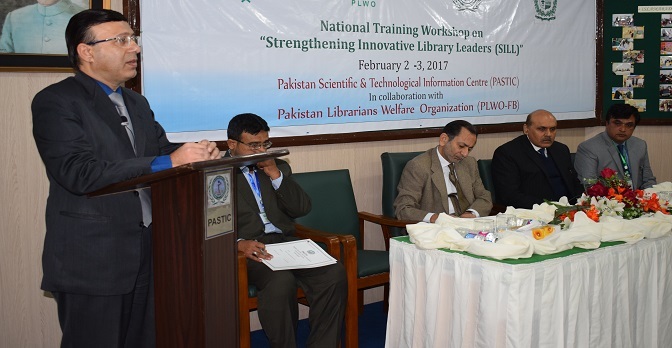 Pakistan Scientific and Technological Information Centre (PASTIC) in collaboration with Pakistan Librarians Welfare Organization (PLWO) organized a two-day training workshop on “Strengthening Innovative Library Leaders” from 02-03 February, 2017 at PASTIC National Center Islamabad. The objective of the workshop was to train and empower librarians to meet the challenges of this digital era by grooming their leadership skills. Federal Secretary S&T, Mr. Fazal Abbas Maken was the chief guest at the inaugural session of workshop. In his address he emphasized on capacity building of the librarians to meet the challenges of present digital era. He appreciated and lauded the role of PASTIC and Pakistan Librarians Welfare Organization (PLWO) for taking this specific initiative. He said that such efforts should be continued for the capacity building of librarians and information professionals. Prof. Dr. Muhammad Ashraf, Chairman PSF and Mr. Naveed Qamar, President PLWO were the Guests of Honor. Mr. Naveed Qamar said that acquiring necessary knowledge and insight about innovative options in library leadership development and competencies is the dire need of present digital era. Overall 40 librarians and information professionals from all over Pakistan are going to attend this workshop. DG PASTIC, Prof Dr Muhammad Akram Shaikh delivering his speech at Inauguration ceremony of the Training Workshop on "Strengthening Innovative Library Leaders" by PASTIC, Islamabad. 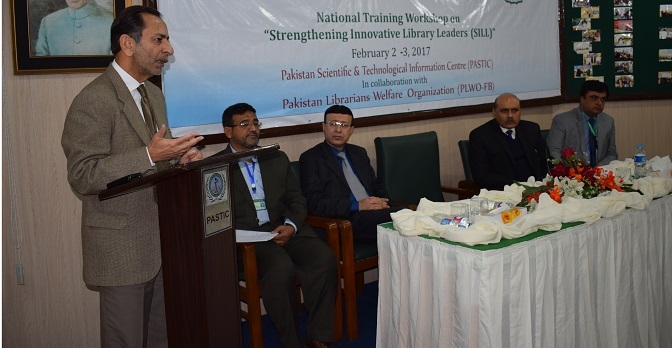 Federal Secretary S&T, Mr. Fazal Abbas Maken delivering his speech at Inauguration ceremony of the Training Workshop on "Strengthening Innovative Library Leaders" by PASTIC, Islamabad.